Scene from ST:TMP of the Travel Pod, with its standardized docking ring, as it docks with the USS Enterprise. When I say I went down the metaphorical rabbit hole on the travel pod door and the docking port it mates with, I feel confident I am not being hyperbolic. I have gone down to the level of trying to work out the internal mechanics of how the door would lock while in flight. How that works with the manual latch handle—which is visible in the filming miniature—in tandem with the door-grabber mechanism which can be glimpsed within the docking port miniatures in the film, and so on. 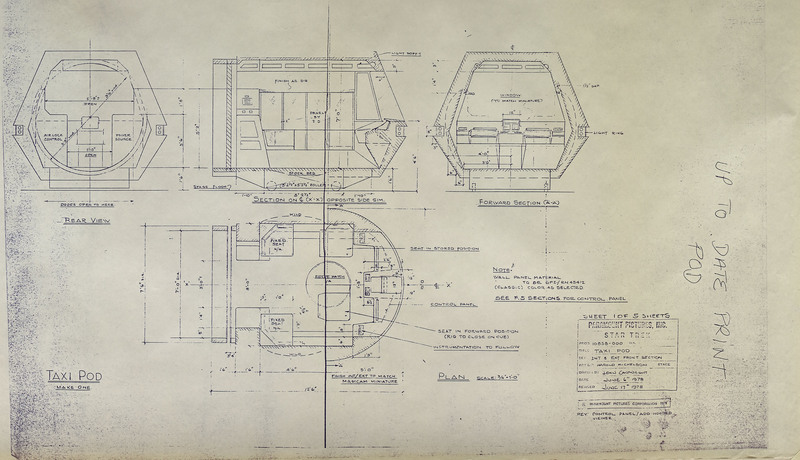 The sheet featuring the Travel Pod in the “official blueprints” drawn by David Kimble in 1980. 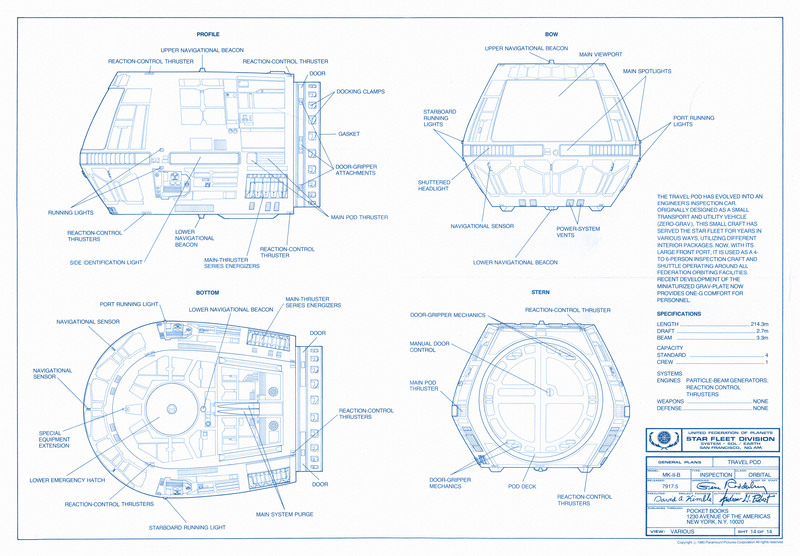 The starting point was the “official blueprints” drawn by David Kimble and first published in 1980 as a fan tie-in during the film’s initial run in the theatre. While the sheet on the travel pod are pretty detailed and seem—at first blush—to be accurate, recreating them digitally began peeling back the metaphorical onion. It has reveled missing details and some inaccuracies in the “official blueprints”. This led to pouring over any and all the reference photos of the original filming miniature, screen-caps from ST:TMP itself, as well as correlating and reconciling one of the the original blueline prints I acquired at auction last year. That drawing being one of the travel pod live-action set construction prints—referred to as “Taxi Pod” in the drawing—which was used to build the set used in the travel pod scene where Kirk and Scotty fly from the orbital office complex to the Enterprise in dry dock in ST:TMP. A bit of trivia, that set was subsequently used in every one of the original cast Trek films. Making it one of the few set pieces to do so. drawn by John Cartwright, revised June 17, 1978. 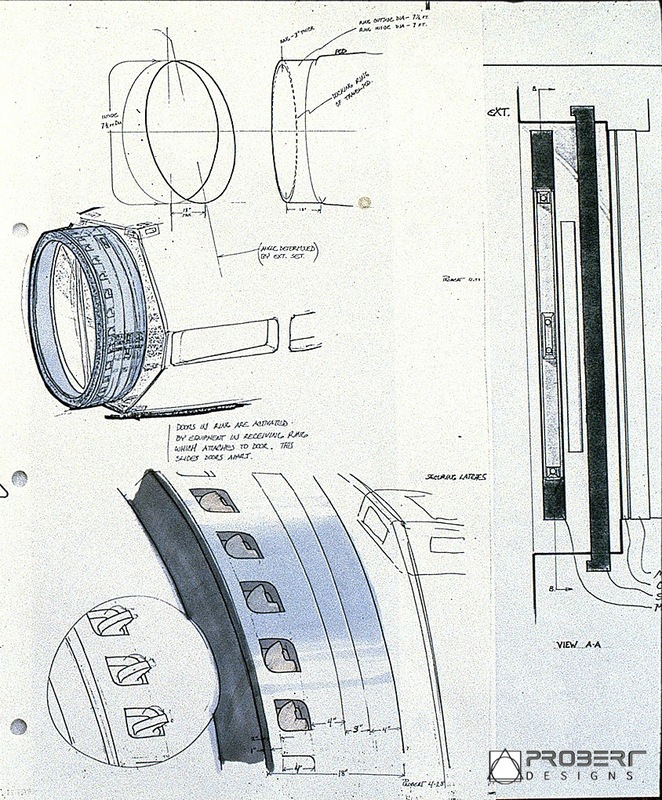 Another key piece of reference material was one of design concept sketches that Andrew Probert made in 1978. That one gives information about—and concept for—the docking ring latches as well as intended scale to subcomponents of the docking ring. Through careful examination of the some of the reference photos of the filming miniature, as well as high-definition screen-captures from the film, it appears some of the dimensions were modified when it was actually built. As I refine and workout the final drawings in 2D and 3D, I will try and explain where there appears to be differences from the concept sketches, and the actual dimensions as built. This includes demonstrating how far the travel pod doors open when docked in the film. That dimension is clearly different from what was noted in the original live-action blueprint drawing. So working in 2D within Adobe Illustrator and Moment of Inspiration (MoI) which is 3D modeling software, I am now on version three of the travel pod doors. One of the things I like about that combination of software is that those applications work well together. I can work out basic proportions and sizes from the Kimble drawings in Illustrator, then copy and paste those as shapes into MoI directly. I can then work out and further refine things there. Then afterwards export that all back out from Moi into Illustrator. That ability to ping-pong back and forth is tremendously useful. All this has really helped me bone-up on my 3D modeling skills while also helping me conceptualize and workout how it all might work “in universe“. That conceptualizing goes from the internal manual latch mechanics I mentioned earlier, to how the door seals would work while in flight, to what must be integral in the docking port itself which must be present to make it not compromise the atmosphere within the travel pod once docked. All this has also lead me to explore and conceptualize what materials might theoretically be used in the insanely hostile environment of deep-space. 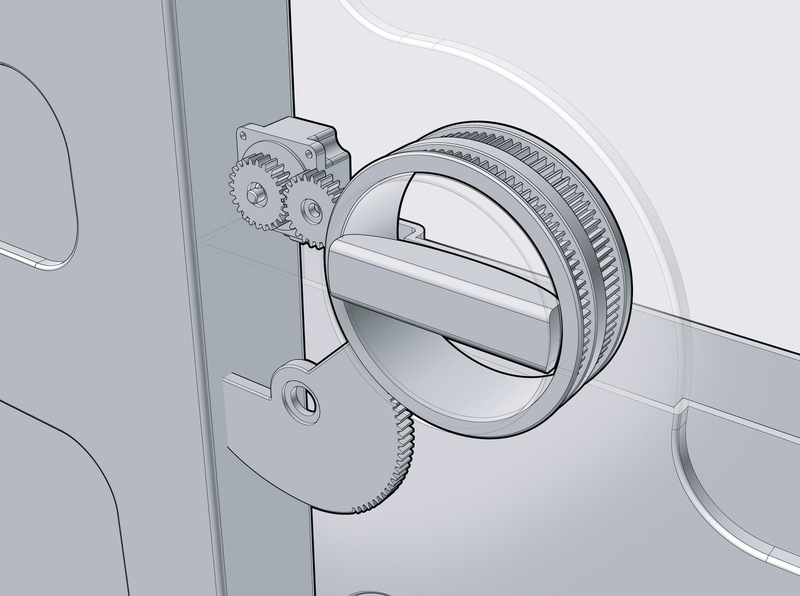 design of the manual door latch mechanism. On that latter point, this prompted me to learn about what types of materials can retain elasticity as well as maintain an air-tight seal at temperature ranging from up to 925 K (the symbol for kelvin is K, which works out to roughly 652 ºC or 1,205 ºF) all the way down 22 K. Which is barely above what is referred to absolute zero (the zero reference point of the kelvin temperature scale). According to NASA, 22 K is the average interstellar temperature in our galaxy. As a point of reference, liquid hydrogen is 20.28 K (−252.87 °C, −423.17 °F). That’s fraking cold. To put it in context, the ISS, the Apollo missions, the space shuttle and so forth, all operated within the relatively more manageable temperature ranges within the so-called “goldilocks zone” of our solar system where the Earth orbits around the sun. The average temperature of space around the Earth is a balmy 283.3 K (10.2 ºC, 50.3 ºF). While that doesn’t seem too bad, even there the temperature swings between sunlight and shadow are still pretty extreme. Shaded objects plummet to temperatures around 173.5 K (-98.15 ºC, -144.67 ºF) and those in sunlight shoot all the way up to 393º kelvin (120 ºC, 248 ºF). Work-in-progress 3D model of the Travel Pod docking ring. Add to it both radiation and free atomic oxygen which can degrade many types of polymers such as silicone—which would freeze and crack in interstellar space anyway—other more exotic materials would be needed. Materials such as Polytetrafluoroethylene (PTFE)—one of the more common formulas of which is sold commercially as Teflon—and other similar polymers. 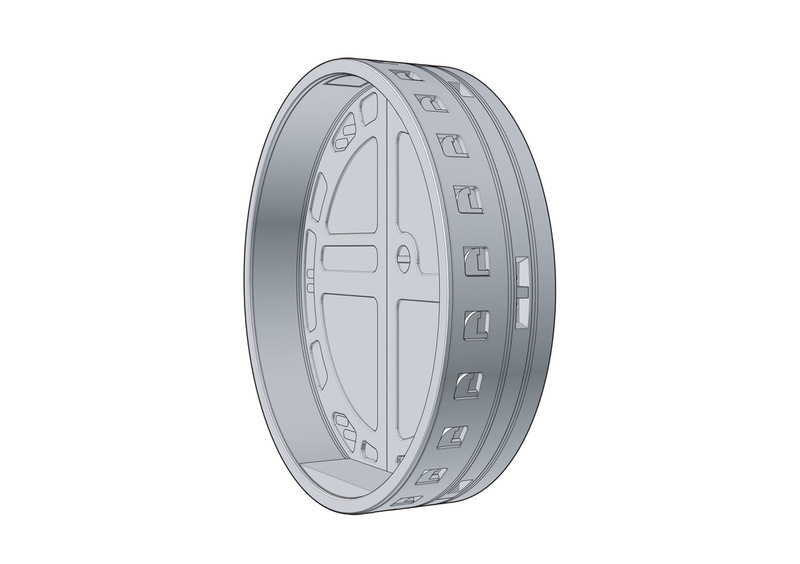 Some of the other things that I began to think about is how ring seals within a cylinder—such as the working area of the docking port as seen in ST:TMP—could be made to expand and contract easily and uniformly. This in turn lead me to read about fascinating materials like dielectric elastomers. YouTube video demonstrating a dielectric elastomer actuator. Those are types of polymers which can be made to expand (or contract) when an electrical charge is run through them. This is part of a very cool newer field of material science such as “memory material” which can be made to deform when an electrical charge (or in some cases temperature) is present or changed. Anyway, all this deep dive was—as mentioned at the outset—part of working out the docking port components in detail, which is part of aft deck area of the bridge level on the Enterprise. As such it—along with 2-3 deck—all impact the shape of the ceiling and interior space where the Officer’s Lounge is located. So it does all tie into each other, but in a very circuitous way. There is some very promising developments about getting some truly rock-solid data about the exterior bridge portion of the original filming miniature. And hopefully in the coming months I will have some news to share on that front. In the meantime, I have moved on to begin working out the primary hull (the saucer portion of the Enterprise) contours and shapes which will be the other key portion of being able to work out the “true” proportions of the Officer’s Lounge, while I wait for more details from the source I have hinted at above. But I have so much still to work through in the meantime. Onward and upward as the saying goes. This entry was posted in Project Enterprise, Projects and tagged 3D modeling, Andrew Probert, blueprints, concept art, David Kimble, docking port, docking ring, illustrator, John Cartwright, MoI, seals, travel pod. Bookmark the permalink.